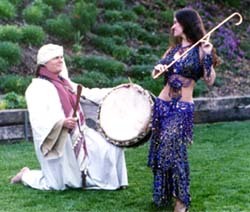 George Medlock offers Middle Eastern drumming classes at the Laguna Hills Community Center as part of the Cultural Arts Program. His Drums of Africa courses in West African djembe and dunun, are also taught throughout Orange County in Irvine, Tustin, Lake Forest, Laguna Beach, and Dana Point. George Medlock began his musical career in New England and currently resides & holds classes in Orange County, southern California. A professional drum maker and musician for over 19 years, and with degrees in Photography and Art History, Mr. Medlock's performances, workshops, research and travel have taken him to five continents around the world. Mr. Medlock has appeared as the featured percussionist on International House Hunters, and featured bell musician in the major motion picture film Dirty and MTV's Poorman's Show, and has performed with notable musicians across the U.S. including: Turkish baglama saz and oud player Turgay Ertuk, Arabic keyboardist Aboudi Badawi, Lebanese oud player Mounir Bayash, African dance instructors Myra Jones Romaine of Dance New England, Julie Calderin, and Deanna Moor, and the Encinitas YMCA Program. He has also worked closely with New Age flautist Lee Gongwer, Lebanese percussionist Walid Assaf, American pianist Pam Wickes, as well as recorded with Marc Solomon and the Deadmen. As percussionist, Mr. Medlock has worked with many organizations and individuals including Martha's Vineyard belly dance, modern dance, African dance, drum circle facilitator, NAACP Gospel Choir, and received an award of excellence from the Orange County Turkish American Association. Mr. Medlock has worked closely with belly dance instructors Tina Enheduanna, Suzannah, Nourhan Sharif, Angelika Nemeth of Orange Coast and Golden West Colleges, as well as with Raquia Hassan of Cairo and other Middle Eastern, West African, and yoga and dance instructors across the US, Spain & Egypt. As a drum manufacturer, Mr. Medlock has hand made ashikos, dununs, djembes, frame drums, Egyptian tabls and Turkish davuls. He worked for many years as a head djembe technician for a leading drum company, facilitated drum circles and both sponsored workshops and taught workshops in drum making and drum playing. He continues to teach Arabic tabla, African djembe and dununs in Southern California. Mr. Medlock has studied with Walid Assaf, Tayyar Akdeni, Mamady Keita, Dibo Camara, Monette Marino and Ali Thomas of Tam Tam Mandingue, Hamish Henkish in Cairo Egypt, Imani, Spider, Magnus McBride, Jimi and Morwenna Twofeathers, Ubaka Hill, Abdoul Doumbia, Mary Ellen Donald, Armundo Mafufo, John Biljizikian, Mimi Spencer, and Die Kunst Der Drums. In addition to his formal training, he is self-taught on Oud, Saz, Rebaba, and Zurna. In November 2007 he released his latest CD, Sweet Fruits for Heavenly Hips, designed for instructors of Middle Eastern Dance. Currently he is teaching drum circle facilitators privately and completing a variety of CD's for advanced students of Middle Eastern and African percussion.